Every so often, in a wave of laziness luteinizing hormone, I crack the shits and refuse to clean. The dishes pile up in the sink, the rim around the bath tub intensifies and the pile of dirty nappies grows so large it has its own postcode. Within a day I realize that I have no clean plates for the next meal, I can’t take a relaxing soak in a filthy tub and the child is walking around bare-assed. I reluctantly pull myself out of the rut in the sad knowledge that I am the Cleaning Fairy in this house. I don’t have wings or halo, but I do have a scowl and a pimple. In fact I’m more Dish Witch than Cleaning Fairy. The folk at Fairy decided to really put it to the test and find out if they could wash an entire town’s plates using just one bottle of the sudsy stuff. 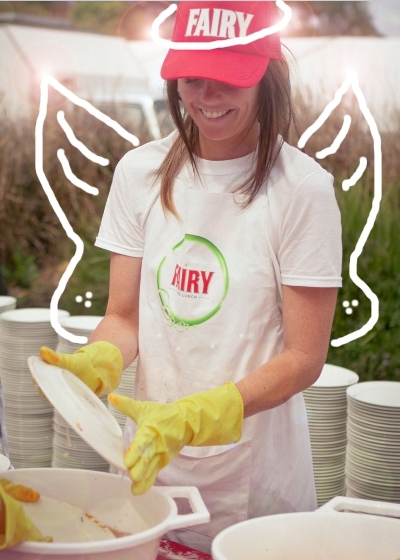 They got celebrity chef Ben O’Donoghue to cook an amazing three course meal at a long lunch and then got a whole stack of Cleaning Fairies to wash all the dishes using just one bottle of Fairy. They chose Margaret River for the deed. It’s a pretty quiet, sleepy place and it’s known for its wine, food, wine, surf and did I mention wine? Well, that is until its schoolies week and the population explodes and it’s known for its alco-pop seeking teens. But generally speaking, there’s a population of 9000 people and everywhere you turn you feel like you’re in a postcard or an ad for Greenpeace. Please tell me I’m not the only one who thought that would have little fairies popping out of the bottle and doing the cleaning? I even envisaged squeegee-topped wands flying over the plates and getting them clean. I’ve put way too much thought in to this, haven’t I? I’m not jealous at all, but Ben, if you’re reading this, next time, feel free to drop around and recreate the experiment here, albeit on a slightly smaller scale. I’ve got some lovely new pots and pans you can play with and I’ll even volunteer to be Cleaning Fairy. Hell, I’ll even put on some fairy wings. Are you the Cleaning Fairy in your house? 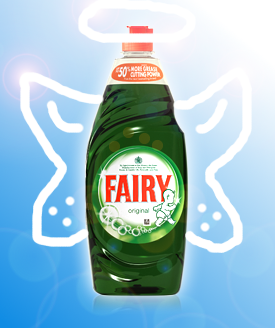 Please tell me I’m not the only one who thought that would have little fairies popping out of the bottle and doing the cleaning? I even envisage squeegee-topped wands flying over the plates and getting them clean. I’ve put way too much thought in to this, haven’t I? And yes, am the cleaning fairy here. Especially as (and I know how whingey and ungrateful I sound here) the first cleaner I tried was crap and the second one didn't even show.